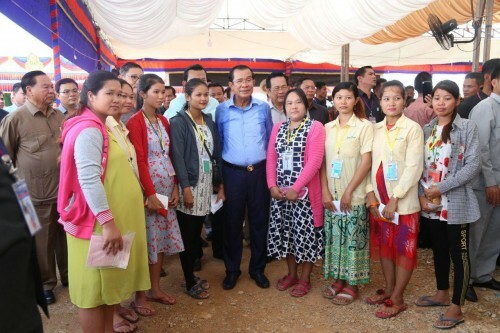 Prime Minister Samdech Akka Moha Sena Padei Techo Hun Sen paid a visit to 28,584 workers and employees from 26 factories and enterprises in Bavet city, Svay Rieng province this morning. Addressing to the gathering, Samdech Techo Hun Sen reiterated the Royal Government’s two clear strategic policies to further improve the workers’ living standards as well as to better the relations with neighbouring and regional countries. According to the Premier, the first policy is to transform all former battlefields into market areas to boost employment and businesses for local people, and the second is to transform the border areas into an area of peace, cooperation, friendship and development. This is to create trade, transport … ties with not only the neighbouring nations, but also the countries in the ASEAN region and other countries, including China, he underlined. This is a clear and long-term plan for the development of our nation, added Samdech Techo Hun Sen. Meanwhile, Samdech Techo Prime Minister expressed his appreciation for the achievements in Svay Rieng province, home to 11 special economic zones, of which eight in Bavet city.